The gist: Learn why batching tasks isn’t a productivity cure-all and why without energy management, bad batching leads to bad burnout. 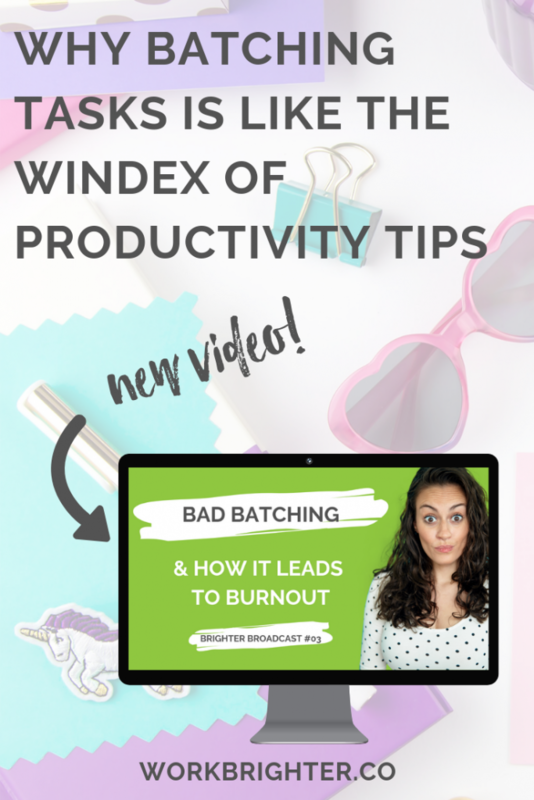 Batching tasks is to productivity experts what Windex is to the dad in My Big Fat Greek Wedding. You remember that movie, right? In the movie, the dad believes Windex is a cure-all for everything. You have a bug bite? Put some Windex on it. You have a pimple? Put some Windex on it. You’re balding? Put some Windex on it. And I feel like batching tasks is treated the same way. Not creating content? Batch it. Email getting out of hand? Batch it. Wanna start a YouTube channel? Batch it. Ever feel like this too? It’s not that batching tasks like email and content NEVER works, it’s just that batching is a vague, generic piece of advice that needs a lot more context to actually be helpful. And without a solid foundation of energy management built up first, you don’t have that context to plan your batches effectively. 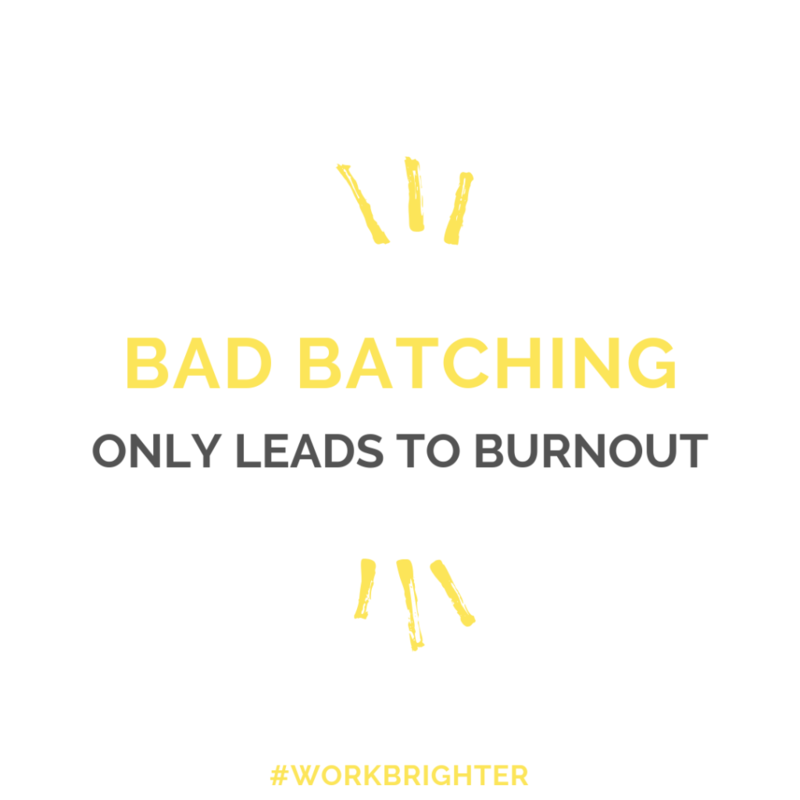 And that’s when bad batches lead to big burnout (try saying that 5 times fast). Before we dig in to the nitty gritty and why it’s sometimes mistaken for something it’s not, let’s get into what batching actually is, shall we? Batching, in productivity terms, is just when you group multiple tasks together based on something…anything they have in common. Based on what app or software it’s performed in. Like, you might do a ConvertKit batch, where you’re doing all types of work, from creating automations to writing copy. But they all have in common is that they take place in ConvertKit. Based on what hardware (if any) they use. You might also have some work you need to do on your computer, some on your phone, and some offline completely. That’s batching based on your work environment or device. Based on what type of work it is. This is a really common one, where you do the same task multiple times. For example, batch creating content or batch replying to emails. Based on what people are involved. If you ever save up certain types of work or certain decisions until your next mastermind call, team meeting, or session with your coach, instead of DMing or emailing them, that’s batching decisions or conversations. As you can see, batching is super vague and general. That’s why just throwing out “batch it” as advice, without more context, isn’t all that helpful. That’s why batching is now the windex of productivity. Batching can be applied to pretty much ANY type of work, really anything in general. But just because you can batch something, doesn’t mean you should. Batching is fairly self-explanatory, and can be applied to anything. So what we need to discuss is why batching works, and how to apply that to your own productivity. Because as you know, work brighter is about PERSONALIZING all this productivity advice thrown out at us. That’s when the batching convo will get good, so let’s get to it. But before we talk about the when, let’s talk about the why. So everyone and their mom has figured out that batching tasks can help your productivity. But what we don’t talk about a lot is why actually batching works. I’m not going to get into, like, the actual brain science because it is brain science. And I’m not going to pretend to be a brain scientist (yes, I know that’s not what they’re called), but I have read a lot of books. I love reading about kind of the psychology behind productivity and habits, and why we do work the way we do. And that side of productivity is really where batching kind of comes in. It all comes down to ease, momentum, and attention. In some cases, batching tasks might make your work easier, or actually create less work for you. In those cases, it will help your productivity, and batching is indeed something you’ll want to consider. For example, take filming YouTube videos. Depending on how you film videos, batching may or may not make a difference for you. And that’s just IMMEDIATE prep on filming day, not including any content outlining or work on the content itself. So if I can film more than one video at a time, I can perform the prep routine less often, potentially creating a lot less and a lot easier work for myself. However, I DON’T batch video content, for reasons we’ll get into later in this post. Batching tasks might also help you pick up momentum. So even if it’s not technically less work or mentally easier, you just pick up momentum and complete the tasks faster anyway. If you’ve ever heard about “the cost of context switching,” this is where it comes in. If you haven’t, context switching is the mental/cognitive load you’re putting on your brain when switching from one task (or context) to another. Think about when you’re driving. You have to slow down to take turns, and move onto exits and on ramps, and to merge or change lanes, all that hard stuff. When you’re operating that 2-ton metal machine, you have to move carefully and slow down in order to speed back up. The same is true when you’re operating your own brain! Switching contexts requires slowing down your thinking, whether you notice it or not. And so when you do a lot of context switching, it’s like constantly changing lanes. That can end up wasting a lot of time and losing a lot of productivity, which is why batching can help. A fantastic example of this is email. You know how sometimes you get into the groove with it and can start banging off replies left and right? That’s when you’re in cruise control on the highway. No slowing down or context switching there. The final main factor behind why batching works is attention. It’s pretty similar to momentum, but more focused on your environment. When you can place your attention on one thing for an extended period of time and keep it there, things will feel easier. Like in the ConvertKit or offline batches I mentioned earlier. In a ConvertKit batch, you might be doing a few different contexts of work, but all your attention is focused on just one website, one tab, one project. You can tune out everything else. And with an offline batch, I can take a notebook and a pen and get ish done. Now that you know the 3 main reasons batching tasks can improve your productivity, hopefully you can start to see where batching can be useful for you. If something really NEEDS a boost in ease, momentum, or attention, go to town on batching it. Sometimes batching is the magic that productivity experts say it is. Sometimes though, batching makes no difference. And sometimes batching can have the opposite effect and it can actually make you less productive and make you burnt out. Why does bad batching lead to burnout? Well first, it doesn’t always create less work for you. Like I said before, it’s all about rebalancing your work, changing the the ease, momentum, and attention. But if one of those three things aren’t one of the reasons that a certain task is difficult for you? Tread carefully. Plus, as dedicated productive unicorns of the Work Brighter community know, energy management trumps all. Your personal energy patterns and strengths impact all your work, on top of how things like momentum and focus impact batched work. Because if you don’t have the energy to get into an email groove or to focus on in-depth content creation, batching can’t magically change that. As an example, let’s look at one type of batching that really burns me out: batching videos. Like I said before, that is one of the rare types of batching content that often does create less work for you. For me, at least, because I have my setup plus hair and makeup (which are way more complicated than setting up). It’s less work to be able to batch videos and record and create multiple types of multiple pieces of video content in one day. 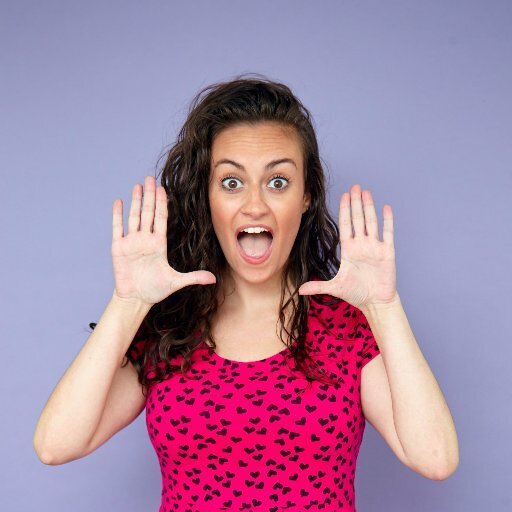 This is what my video marketing coach, Trena Little, does. She films like 10 videos in one day! However, my chronic illness and fatigue means once I consider the energy management side of it, batching videos is a risky endeavor. The content created later in the batch is NOTICEABLY lower quality than at the beginning. I get a “productivity hangover” afterwards, and need a rest day. So just prepping and filming one video is enough for me to require a nap to save my spoons. That’s how you can really figure out if batching the tasks you’re looking at will actually make you more productive, or lead to bad batching burnout. Want to start learning more about your energy so you can plan and batch accordingly? Download our free energy management tracker or join the Work Brighter Clubhouse to take our energy challenge.